Is it any wonder that increasing numbers of hoteliers are forsaking New York’s congested concrete canyons for the boroughs? 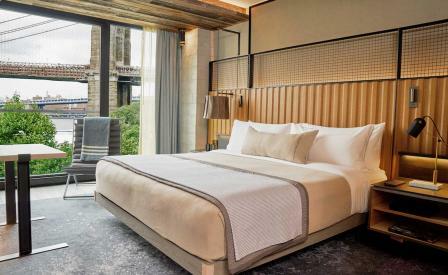 For now, the 1 Hotel group has stolen a march on its competitors by opening a third property, following Manhattan and South Beach, on Brooklyn Bridge Park, just a two-minute ferry ride to Wall Street. Featuring views of Brooklyn Bridge, Brooklyn Bridge Park, the East River and Manhattan’s shimmering skyline, the new pile is designed by New York-based firm INC Architecture & Design with interiors that make extensive use of regional and reclaimed materials, including original heart pine beams from the former Domino Sugar Factory, walnut from the Brooklyn Botanical Garden and pine flooring from the Old Crow Distillery in Kentucky. The 194 rooms are dressed in native natal mahogany trees, Green staying true to his moniker by installing a lush 25ft-tall living wall of creeping figs and ferns in the lobby lounge.